Yesterday I had a bit of a crisis with heat stress. It was the second day in triple digits here in Portland, and it got to me. My wife noticed a rather large red streak in front of my right ear. That�s not good. It was not blood above the surface, but below it. Red colorations in flare-ups on the body always indicate heat that is either toxic or dangerous to the balance of the body, especially the cardiovascular system. We both had been taking Wormwood, a good blood cooler for summer heart and blood purifier/pain reliever for skin conditions/joint pains. I was just not taking enough of it. Our apartment got to at least 94�F. So please, be careful in the heat. Yes, drink enough water, but here are some other tools for dealing with summer heat if it is more stressful to you. This is an excellent blood/body cooler. In fact, Starbucks� Passion tea made by Tazo has a lot of Hibiscus flower in it and can cool you down better than all the other cold beverages they sell. Brew up enough to have it ready in the fridge for days at a time during a heat wave. Sweeten it enough (it�s pretty bitter), and it will taste like cherries. At home I make Hibiscus flower tea with the powder, but you can use crushed flower bought in bulk, or in tea bags. Just brew it stronger as the summer heat increases and affects you more. Hibiscus cools the interior of the body so effectively that if you drink enough of it when you don�t really need it, like in winter, it can cause cramping of the GI tract (cold pains). It truly chills you down! Wormwood herb can be found almost anywhere bulk medicinal herbs are sold, usually in the Cut/Sifted form. We take �shots� of 1-2 oz strong Wormwood tea made by using 1/2 cup C/S Wormwood and pouring 24 oz boiling hot water over it in a sturdy vessel. We let it steep overnight, so it cools down. Then I pour it up into a 24 oz bell jar, screw a lid on, and stick it in the fridge. This is not a tasty beverage! Its taste is so bitter it will linger in your mouth for hours. You can sweeten it with whatever you prefer. This bitterness is also evidence of its digestive and liver toning properties. You may notice your appetite comes back in the heat and discomfort under your right rib cage eases up. I recommend Mountain Rose Herbs, Starwest Botanicals, Monterey Bay Spice Company, and Frontier Herbs as good places to get bulk herbs. Otherwise, check your local health food cooperative or local herb shops to get a good deal. We can lose a lot of this through perspiration in summer. So keep some Potassium tablets. Even the typical tablets with fairly low doses of it will be effective if you take 2-4 at a time, maybe twice daily if you are hot and perspiring a lot. Otherwise, you know that Bananas are potassium-rich. Tomatoes, celery, carrots are as well. Just increase your intake of it in summer heat, whatever way you can. These are remedies that can be found in tubes of white lactose pellets in local health groceries, co-ops, and supplement stores. The most popular brand is Boiron, but all brands that I�ve tried are effective. Sol is the remedy made from the natural rays of the Sun. (Sol = Latin for Sun). This can be good for counteracting too much Solar Radiation. Click here for a description of the Sol remedy�s properties by indicative symptoms. Sulphur is the most commonly needed homeopathic constitutional remedy that can also help with heat-related conditions (itching, burning skin, etc) that can flare up in summer. It is also the #1 detoxifier in homeopathic medicine. It helps balance the sulphur content of the body. You can read about Sulphur in the homeopathic material medica by clicking here. Phosphorus is a major constitutional remedy in homeopathy. It helps balance the person with internal heat and stimulation that can be like an over-caffeinated person with burning pains, chest troubles, etc. It helps rebalance phosphorus in the body at a deep level. You can read about Phosphorus in the homeopathic material medica by clicking here. Natrum Muriaticum (Nat mur) is also a major remedy that can help constitutions more prone to depressive stagnancy and complex feelings who wilt in the heat. It helps rebalance the salt/sodium in the body when it is deficient or in excess. You can read about Nat Mur in the homeopathic material medica by clicking here. NOTE: not all these homeopathic remedies are compatible, so take the one that most seems to fit you and your situation. Those both have similar qualities of reducing heat and fever, especially when there's also a headache. If when you get over-heated you get a headache, first try Poppy Seeds or California Poppy herb. I just eat the seeds (1-2 tsp/dose), chewing them up well. The medicine starts working pretty quickly that way. You could bring 8 tsp Poppy seeds to a boil in 16 oz water, then cover and let steep until cooled enough to drink. Store in fridge, and drink 4-8 oz at a time. I will be making California Poppy extract at some point, because it is one of those herbs that I think should be kept around all year, because of its fever reducing ability, headache relieving ability and just being a general calming nervine (daytime or for sleep). So inquire with me if you're interested in some California Poppy extract. You can find some online from Herb Pharm, but they are currently out of stock. However, these are not the most potent extracts and if you need to use a lot, you'll find yourself running out pretty quickly. At $14/1 oz bottle that gets expensive! So if there's enough interest, I'll try to make a substantial quantity of more concentrated extract. I have developed extraction methods and have equipment that can often create a superior extract and for a very affordable price. Hi Kannon, may I ask a question about homeopathy? (as you seem knowledgeable) Is there an explanation as to why homeopathy works? Just that people who I know think it's completely bogus and a sham. Homeopathy is two different kinds of medicines made by the same process. The principle of its action, Like cures like recognizes vibrational influence from the individual frequencies of substances and their relation to the body and its needs. So homeopathy is first an organic chemical medicine to start with, and in its lower potencies (under 24x, under 12c). It is also an energy medicine in remedies above those potencies. Homeopathy's microdosing is principle behind vaccinations. Allopathic medicine stole it from homeopathy (not giving it credit). Homeopathy, the use of micro-doses aimed at stirring the body's own healing capacity, has its original in classical Greek medicine. Those today who reject it are still attempting to assert the 'heroic' medicine of gross (often toxic) substance over the very notion of energy in the body or anything that reeks of "woo-woo." Most of your friends are probably just ignorant about actual homeopathy, but have been effectively propagandized by the hyper-rationalists who have been aggressive in the last decade or more. They have been very persistent on wikipedia and in blogs, etc, putting forth the idea that homeopathy is a fraud, simply because when some of the remedies are examined chemically nothing is found in them. That is true -- for those remedies at potencies above 24x or 12c, which are energy medicines. They carry the energy signature of the original substance, but none of the molecules. It's all about who you get your information from. Homeopathic remedies have helped me tremendously when nothing else could. Try telling a suicidally depressed person who has been relieved by a high potency dose of Aurum metallicum that homeopathy doesn't work. They simply cannot take you seriously, and they know such claims are just intellectual bigotry. Modern (allopathic) medicine applies the principle of homeopathy every time it administers the micro-doses of a vaccination. It's just not honest about it because the aim of the AMA in the mid/late 1800s was to destroy homeopathy, which it nearly did. It is ironic that there has been such conflation of homeopathy use with being against vaccines. I'm not against vaccines, because I understand how they work! But homeopathy does it better because it applies the whole principle at work with fewer risks. It takes an enormous amount of arrogance to wipe away the experience of millions of successfully treated patients over two centuries since homeopathy was modernized with the potentization process. The anti-homeopaths are anti-vitalists who abhor the notion of 'energy' being mentioned by anyone but a physicist. Tell them to read The Body Electric with an open mind and then tell you they don't believe in 'energy' flowing through the human body. Homeopathic medicines simply add in subtle energy signtures that can bring a person into balance. Tell your friends they are being influenced by hyper-rationalists and self-appointed debunkers who don't know the first thing about homeopathy itself. It is a war of systems of thought in medicine: heroic chemical medicine (allopathy) vs gentler natural medicine (homeopathy). It is not their war and they've been recruited by the closed-minded medicine police. The principles that make homeopathy effective, however, are an entirely separate matter from the quality and effectiveness of a particular practitioner of homeopathy. I believe the best practitioners today are in India. Dr Rajan Sankaran and his fellows at his clinic in Muambai, for example. Dr Rajan has done great work to move homeopathy forward to a more refined practice. I'm about to order his book on the natural kingdoms today. Ask them if homeopathy doesn't work, has nothing in it and is only 'placebo' effect, would they be willing to give something like the remedy Arnica a chance to relieve bruises/bumps/sorness. Maybe have them apply it to their next bruise/soreness and see that it works. Tell them not to take anything else simultaneously so that can get a clear-cut test of it. That's if they're open-minded enough. Thanks so much for a fantastic and well thought out response Kannon. I will definitely investigate this further. It'll be summer again before you know it. Geez. I can't see summer through the haze of sick phlegm inside my head. The irony is that many of these herbs used for reducing summer heat can be used to break a fever as I did just a couple days ago with concentrated Wormwood tea. 1/2 cup cut-and-sifted Wormwood herb in a pint of water in a small pot. Close with lid. Bring to a boil, reduce to simmer for a few minutes. Let cool. Take 30-60mL per dose. Use a potato peeler to peel 2-3 oranges. Put in 1 quart purified water in a pot and close tightly. I put a heavy mug on top to keep the lid from bouncing and letting out the steam, which contains the orange oil medicine. Simmer this for at least 1/2 hour before pouring over tea bags (or drinking hot). Take 2-3 times daily until phlegm is cleared from chest and/or head. 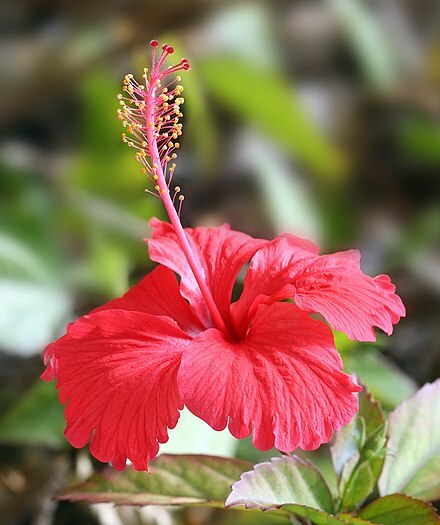 Hibiscus can also be used to counteract inflammation and break a fever. I chose Wormwood because it is anti-rheumatic and my joints were really inflamed and hurting. It worked perfectly. If no joint pain had been present I would have chosen the Hibiscus. The key is taking enough often enough until you get the desired result. A good recipe for Hibiscus would use about the same proportions as the Wormwood recipe: If using unground flowers, crush them until they are in small bits and use about 1/2 cup in about a pint of water. Bring to a boil while covered and reduce to simmer for a few minutes. Then take a shot of 30-60 mL. Continue with those doses every 2-3 hours until the fever breaks and you feel relief of most of the pain. It interests me so much learning from your story combating cold and heat with wormwort tea. Especially with the bitter and strong taste. In China, in spring time we could buy fresh wormwort in the market. Some people mix chopped wormwort with eggs for omelette. Or make wormwort cake. But I never heard people drink wormwort tea here. I would like to ask why you choose wormwort tea instead of ginger tea? Ginger tea is hot in its energy and its warming effect is inappropriate for summer use. Wormwood herb has a cooling/cold energy, considered a refrigerant because it can cool the blood and lower body temperature in fever or in summertime overheating of the body. Wormwood herb has a cooling/cold energy, considered a refrigerant because it can cool the blood and lower body temperature in fever or in summertime overheating of the body. I just checked baidu.com and most say wormwort has warming effect. But I have heard one famous TCM doctor said not to worry of overheating with wormwort as it has cooling energy. Yes, Wormwood aerial (leaves), Artemisia abrotanum is not warming, but cold in nature. Still snowing in some parts! I hope it doesn't reach triple digits here this year. Using shots of concentrated Wormwood tea from the beginning this summer, I'm handling the heat better than I have in years.